One of the European Union’s smallest member states, with a population of 1.3 million, is one of its most optimistic, too. Or, put another way, it’s one of the bloc’s least pessimistic countries. 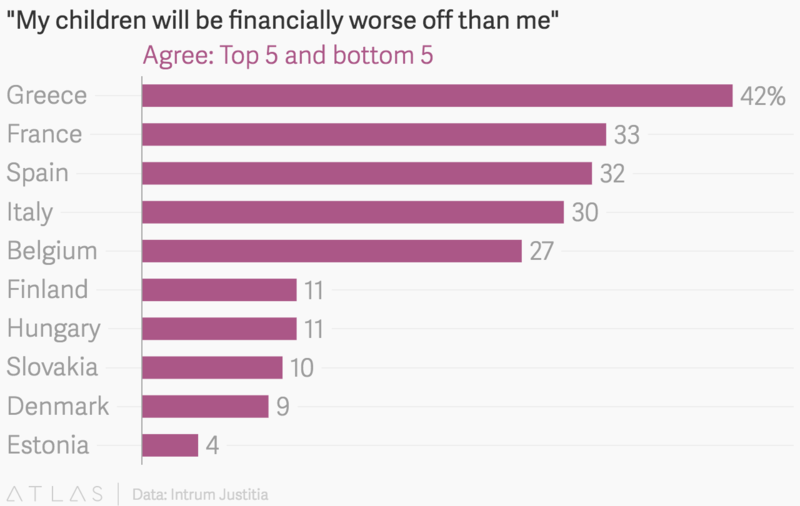 Only 4% of Estonians think their children will be financially worse off than themselves, according to a recent survey (pdf) by Intrum Justitia. Estonia’s response was much lower than the European average of 18%. Denmark and Slovakia were also relatively upbeat about the next generation’s prospects, with 9% and 10% agreeing to the statement respectively. When a different pollster asked Americans a similar question in January, 56% thought the next generation will be worse off financially. Although Estonians have faith in the fortunes of the next generation, many aren’t expecting an immediate improvement in the economy. Only 17% think the economy is getting better, which is slightly lower than the European average of 20%. By contrast, the Irish have the most confidence in their economy, with 34% thinking it’s getting better, followed by Netherlands (32%) and Switzerland (30%). The Greeks were the most pessimistic about the future of their country; 42% think their children will be financially worse off and only 5% think the economy is getting better. When asked about their personal finance, 68% of Greeks admitted they are sometimes unable to pay their debts—the highest among all countries surveyed. The French are also downbeat. Only 13% think their country’s economy is getting better, while 33% expect their children to be financially worse off than their parents. Just over 21,000 people from 21 countries took part in the survey, conducted in September. As for Estonians, they may be feeling a little less optimistic since the survey was conducted. Conflicting views on how to improve the economy resulted in the government collapsing on Nov.9, after the prime minister lost a confidence vote in parliament. The country’s new prime minister, Juri Ratas, comes from party with links to Russia (paywall).